An authentic Rat's Hole Studios shirt featuring BDR artist Ed “Big Daddy” Roth. An original 30-year-old Kustom Kulture inspired Rat Fink muscle mayhem vintage iron-on heat transfer print on a new and unused shirt. Extremely rare "New Old Store Stock" 1968 Von Dutch contemporary BIG DADDY ROTH! 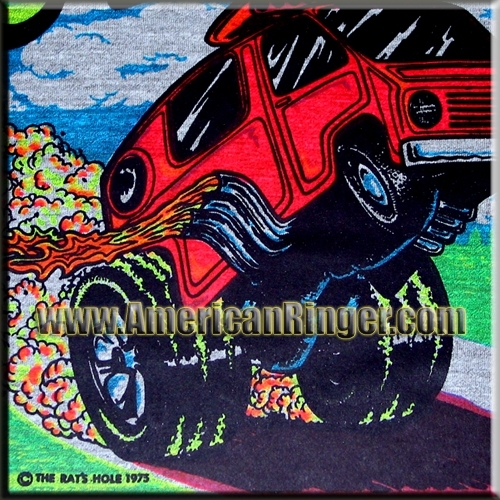 This is a real print from the RATFINK artist's "Rat's Hole" shop! Ed Roth inspired Hardy and a slew of modern day Kustom Kulture and tattoo designers. It's near impossible to find any Chevrolet, Ford, Pontiac, or Mopar items from the original Rat's Hole line, but we've got them for you right here! 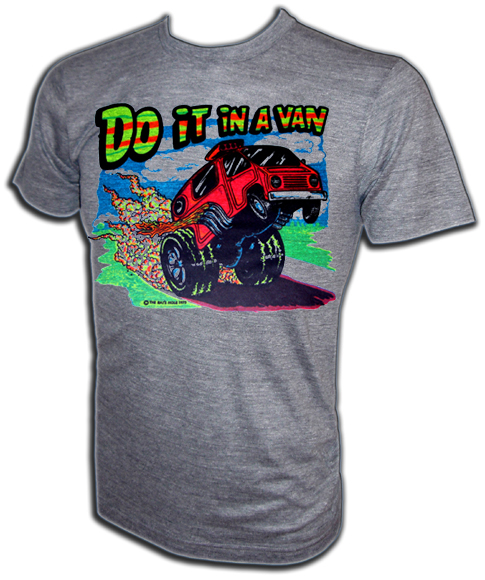 "DO IT IN A VAN" says it all, a true sign of the times. A truly rare find that American Ringer has acquired and NOBODY ELSE has! This is the real deal vintage stuff only available from American Ringer. This is the real deal vintage stuff and once they are gone they will be gone forever.